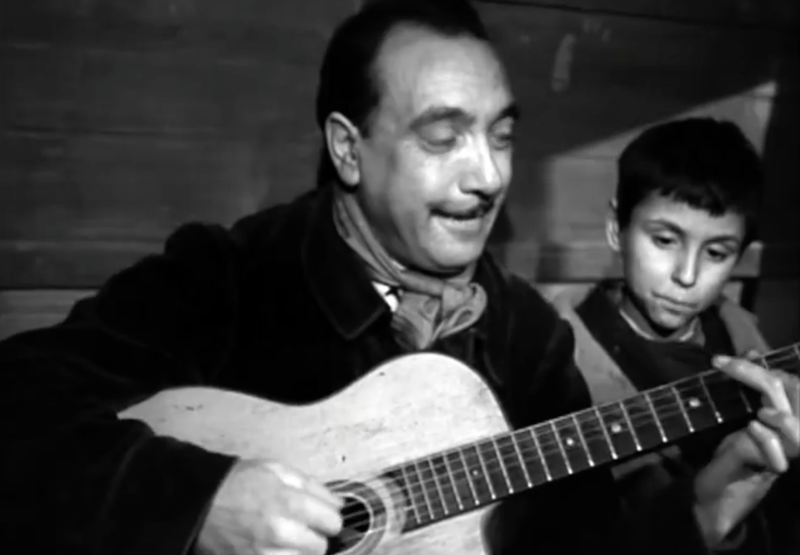 Django Reinhardt in the 1953 film "La Route du Bonheur"
Unfortunately, only a handful of film clips exist showing the great Django Reinhardt performing. So when so when footage of him appears in such high quality (even though the performance of the song “Nuits de St. Germain des Pres” is mimed) it is a real treat. The video clip below shown below is one such example. Taken from a 1953 French-Italian comedy known as La Route du Bonheur, and featured numerous musical stars of the day including, trumpeter Louis Armstrong, jazz sax and clarinet player Sidney Bechet, singer Juliette Gréco, and Reinhardt himself. In the short scene, Django and his band perform in a train car. The context of the performance not overly clear, however, the film provides excellent shots of Reinhardt’s unique fretting hand in action, using only the index and middle finger of his left hand as his fourth and fifth fingers were paralyzed when he suffered burns in a fire as a teenager. Amazing stuff. I want more!